Mr. Osomination! does it again. Not surprised at the following titles. Congrats for beating an American CGI movie. I wonder what this will do for how the anime industry is shaping itself. People always make the statement that moe gets made because it sells, but I would hardly call Mr. Osomatsu moe, and I wonder if studios that will start to aim for that more. I think part of what Miyazaki said is true (a lot of otaku become animators and just make what they want), but I feel like some companies that can't just do that will start to shift away from just trying to rely on moe-bait/appeal. Ha, Re:Edgy got outsold by cute girls and rabbits! 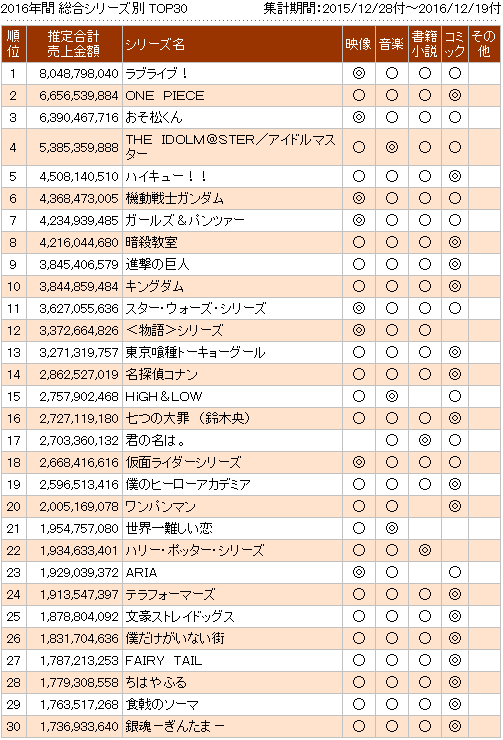 FWIW The massive success of Mr Osomatsu means that total sales (not accounting for format, volume numbers etc) of the top 30 titles was up 259749 units, or 7.7% compared to 2015. For Japanese releases, sales were up 11%. Even without the impact of Mr Osomatsu, sales were still stable, which stands out from Light Novel sales which would have seen a significant decline without the success of your Name. Having said that, there was a notable drop in the number of titles selling 100-199k units (6 compared to 11) & the top selling new late night anime after Mr Osomatsu was Is This Order a Rabbit? with 86886 units. In 2015, 3 new late night series sold over 100k units (Shirobako, Kan Colle & Blood Blockade Battlefront). What is perhaps notable is that neither Re:Zero nor OPM were able to break 100k sales, despite their online popularity. In short: it was a great year for Mr Osomatsu, a good year for established franchises & mediocre one for new titles. Surprise comedy hits like Mr Osomatsu are not unprecedated (The World of Golden Eggs & Peeping Life, for example). However, those titles should tell you that it's too soon to know if Mr Osomatsu is going to maintain its success, or become another flash in the pan. Wonder what next years sales period is going to look like, seeing as Your Name hasn't had a physical release as of yet. Betting is going to beat most of the current numbers. Come on, give us season 2 already. Keep in mind re:zero's volume 7,8 and 9 weren't released by the time this list was made. Otherwise it could have easily been above 100k. It's cool. Only 6 of 13 BD/DVDs were released until now. The sales are actually very stable since Part 3. Congratulations to Osomatsu-san winning the chart by a landslide! I'm also thrilled that Girls und Panzer der Film made it among the Top 5! In addition, the first Mr. Osomatsu DVD/Blu-ray Disc volume topped the combined animation/special effects (tokusatsu) DVD+Blu-ray Disc category with 114,548 copies sold. This quote definitely needs further clarification as it is behind several other releases in terms of DVD+BD copies sold.